DOVER, Del. — As part of National Cyber Security Awareness Month, Governor John Carney on Wednesday joined Delaware Department of Technology and Information’s (DTI) Chief Information Officer James Collins and Chief Security Officer Elayne Starkey, as well as representatives from the Delaware Department of Education and National Security Agency (NSA), a host of cyber security subject matter experts, and over 400 attendees at the 2017 Secure Delaware Workshop to highlight the importance cyber security training across all lines of government, business, and citizens to strengthen our readiness and response posture. CIO James Collins, DTI; Christine Parker, NSA; Deputy Secretary of Education Karen Field Rogers, DOE; CSO Elayne Starkey, DTI, Governor John Carney; and Kim Paradise, LifeJourney, take a photo in front of a DART bus promoting cyber security. During the event, Governor Carney announced the official launch of the Delaware “NSA Day of Cyber” School Challenge, a free statewide program designed to ignite interest in cyber security among the state’s youth by enabling them to test drive occupations with the fully-funded online cyber security career exploration platform. “Organizations are having difficulty hiring cyber talent, and many positions are going unfilled. 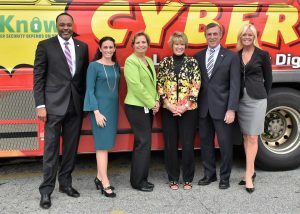 The ‘Day of Cyber’ Challenge provides an exciting platform for Delaware students to start thinking early about cyber security and related fields so we can better prepare them to have the foundation they need to compete in an increasingly globalized workforce,” said Dr. Susan Bunting, Secretary of the Delaware Department of Education. The Secure Delaware Workshop, hosted by DTI, the Greater Wilmington Cyber Security Group, Delaware League of Local Governments, Delaware Technical and Community College, and the Delaware Small Business Development Center was held at the Dover Downs Conference Center in Dover. Additional agenda topics ranged from current trends, managing risk and federal/state cyber security policies to privacy issues, malware detection and emerging technologies such as block chain. To sign up to participate in the Delaware “Day of Cyber” challenge, visit Bit.ly/DEDayofCyberChallenge. To learn more cyber awareness and resources available to prevent cybercrime, visit digiknow.dti.delaware.gov. 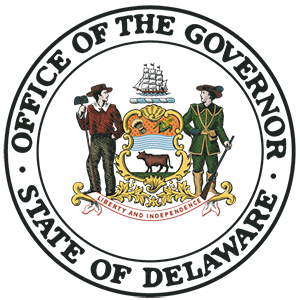 The Delaware Department of Technology and Information (DTI) is the state’s central IT organization, chartered to deliver core services to other state organizations and exercise governance over the technology direction and investments of the state. DTI provides innovative enterprise services enabling other organizations to effectively fulfill their missions. The NSA Day of Cyber, sponsored by the National Security Agency and powered by the LifeJourney technology, is an online, self-guided career exploration and mentorship platform that enables students to test-drive cyber careers and live a day in the life of six leading NSA cyber professionals. Each student will receive a Cyber Resume and Certificate of Completion signed by the NSA. The NSA Day of Cyber experience is available, at no cost, to be run by schools and organizations anytime throughout the year. Schools, teachers, organizations, parents and students can register at http://nsadayofcyber.com. LifeJourney ™ is the leader in cyber security and STEM online career exploration and simulation. A web-based tool for the classroom that enables students to explore, discover and test-drive exciting careers of America’s STEM and Cyber security leaders, and thus become informed and inspired to follow the related STEM pathways to achieve those futures. The LifeJourney experience enables teachers to directly connect what they are teaching in the classroom to what students learn through the tools and technologies of organizations defining the workforce needs of tomorrow. www.lifejourney.us.